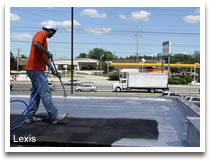 EPDM Coatings has been a supplier of Specialty Roof Coatings worldwide since 2001. These products are contractor grade and are shipped within 30 days of manufacturing. These coatings provide long-term protection, energy efficiency and cost savings for our customers. A knowledgeable staff and excellence in customer service are the reasons why our customers have come to trust EPDM coatings time and time again throughout the years. Our product line provides solutions to various types of residential and commercial roofing applications. Many of our coatings will result in a 30 mil dry finish when complete. All products provide a seamless, durable membrane. As low as 55 cents per square foot. High Tensile Strength and Elongation properties allow to endure extreme temperature swings. Superior adhesion to various substrates. Several contain fungicides and mildewcides. 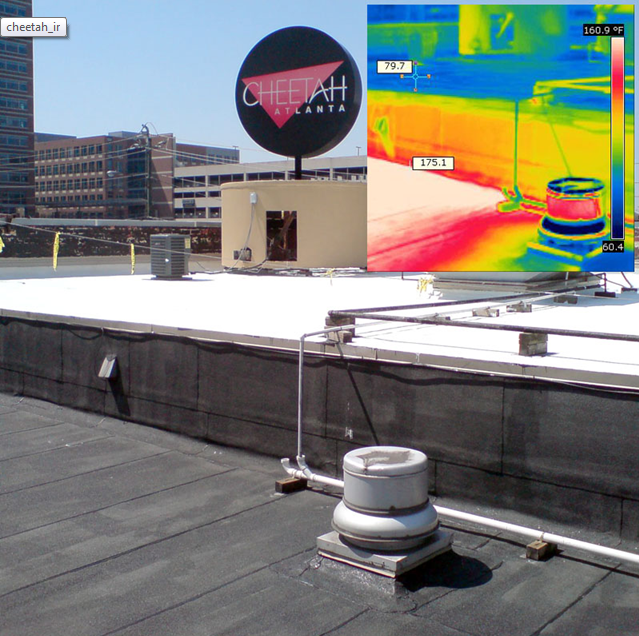 Heat reflective coating helps reduce cooling costs. Reflects the sun's UV-rays and prevents premature degradation. These contractor grade coatings have been used over the years for roof leaks repair and to extend the life of all types of roofs; including concrete roof leaks, metal roof leaks, flat roof leaks and built-up roof leaks repair etc. 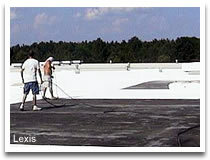 Roof coatings prevent degradation by the sun (ultra-violet radiation). A thickness of 30 dry mils is optimum for long-term preservation of your roof. Once fully cured, your roof will have a seamless, watertight membrane. During new construction, caulks and sealants are used to waterproof around flashings, vents and other protrusions throughout your roof during roof repair. These roof coatings acts as a shield to protect existing caulks and sealants and extend their life substantially. Built-up, modified Bitumen and Polyurethane roofs can be easily waterproofed and repaired with our roof coatings. The useful life of metal roofs, whether galvanized steel, or aluminum will also be extended. These products are the most cost-effective product for solving repair and leak problem; they do not chalk or shrink. Our one-coat applications save your time and money sealing and protecting for many years to come. 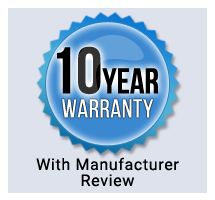 All products are shipped within 30 days of manufacturing to insure their quality in the field. 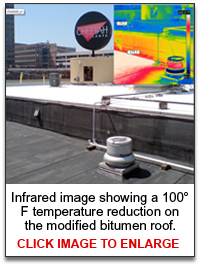 Built-up roofs (BUR) are dark colored roofs which can reach a scorching 180°F in the summer. They are made of tar or asphalt which dries out, becomes brittle and cracks. Leaks are difficult to find. Concrete roofs are porous and absorb moisture. Moist concrete promotes rebar corrosion which causes structural damage. Uncoated concrete roofs absorb solar heat in the daytime & slowly release it at night. Metal roofs do not have to be old and rusted to leak. A high pitched metal roof is just as prone to leak as a low sloped one. 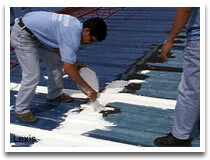 Roof patches and other temporary fixes can aggravate the leak. 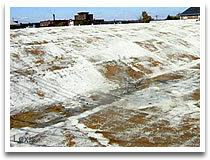 Modified Bitumen roofs need to be coated if noticeable granule loss occurs. Don't wait until you see crazing, cracking or blistering. Ponding conditions accelerate defects. 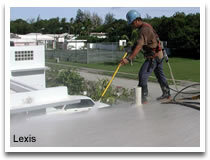 Polyurethane spray foam is not UV-resistant and starts deteriorating as soon as it is installed. 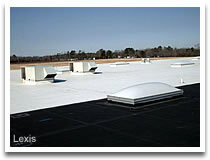 Elastomeric coatings block harmful UV-rays and provide a seamless, watertight membrane. Single ply roofs like Ethylene Propylene Diene Monomer (EPDM), Thermoplastic Polyolefin (TPO), Polyvinyl Chloride (PVC) and Hypalon roofing become brittle over time.